If you haven’t seen Saving Mr. Banks, you are in for a surprise! Saving Mr. Banks was officially released on DVD and Blu-Ray today, and I got my hands on it early this morning. I knew as soon as I saw the very first preview for the release of this film in the theater that I was going to fall in love with it. Boy, was I right. After watching this film in theaters, It was no question that it would be part of my DVD collection. Saving Mr. Banks follows the heartwarming and incredible true story behind Walt Disney’s struggle to court Pamela (P.L.) Travers for the rights to replicate her original story of Mary Poppins into a movie. After all, he made a promise to his daughters that he would do so, and said he won’t break any promises to them. Throughout the film, you are exposed to the struggles and special moments in P.L. Travers’ life that allow you to see why her story of Mary Poppins is so meaningful, and why her constant conflict with Walt and the Sherman brothers (who wrote the music for the film Mary Poppins) reflects the incidents that happened in her childhood. Saving Mr. Banks has a brilliant cast including the brilliant Tom Hanks as Walt Disney, Emma Thompson as P.L. Travers, and Colin Farrell as Travers Goff (P.L. Travers’ father). It is breathtaking to watch the film making behind the scenes and how strong the bond between characters can be. Although Saving Mr. Banks is a Disney movie, it is rated PG-13, and is not intended for children under 13 years old. In my opinion, this is not appropriate for the little love bugs due to a few scenes with alcohol use, as well as an in depth story that is beyond any child’s comprehension and understanding. Children will have a hard time understanding the role of the adults in the film because there isn’t much they can relate to. Saving Mr. Banks on DVD and Blu-Ray includes the full length feature as well as deleted scenes, a tour of the Disney Studios lot by director John Lee Hancock that reflects the studio life during the making of Mary Poppins, singing by the cast and crew on the last day of filming. They sang the classic, “Let’s Go Fly A Kite” as a heartfelt tribute to the composer of the original Mary Poppins, Richard Sherman. When you purchase Saving Mr. Banks on DVD or Blu-Ray, you will automatically get a digital copy on iTunes and for your Disney Movies Anywhere app. Simply enter the Disney Movie Rewards code into your Disney Movie Rewards account and it will automatically be sent to your Disney Movies Anywhere account. For iTunes, enter the code in your iTunes account. This is a great way to get points on your Disney Movies Rewards account, and several options to view your recent DVD purchase. Did I mention that Disney Movie Rewards and Disney Movies Anywhere are free? My rating for this film is 5 out of 5 stars! 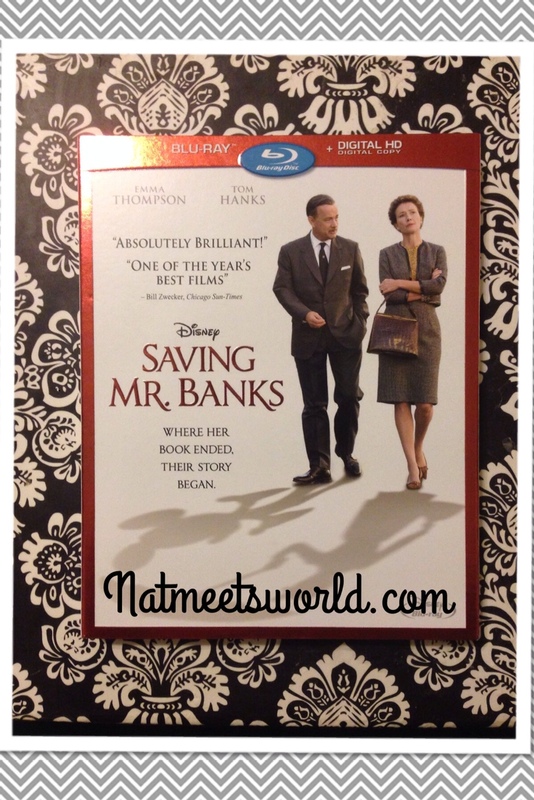 Did you watch Saving Mr. Banks? What did you think of it? Comment Below!